We offer canopies in two sizes 4x4x7 ft and 6x6x7 ft, with free delivery in India via Fedex. Canopy are printed on high quality flex with original ink printing for best output. [+] IMPORTANT - Currently we are delivering canopy only in NCR and Mumbai. In last 5-7 years, canopy is widely seen & used in India. Still, it is highly likely that you will see them in major metros like Mumbai, Delhi, Bengaluru, Chennai, Kolkatta etc, but even Tier 2 & Tier 3 cities are fast grabbing them. 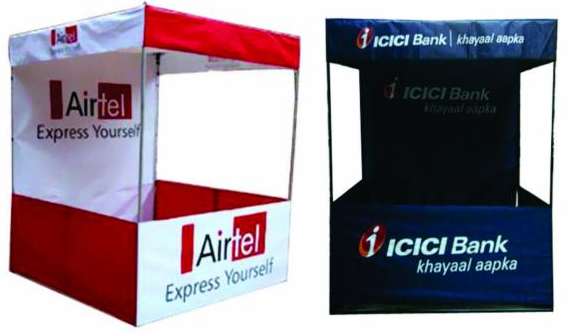 These promotional tents are available in different sizes as per sales team people you wish to fit in. We at Whizz Prints, offer event set up services & know the cost of banner printing & installation in an event in Pragati Maidan, Delhi or Goregaon Bombay exhibition ground can be very high. Only few well to do businesses can manage a booth or stall of any respectable size in these location. For all other businesses canopy is one product which has comes their rescue. With practically no orders 3-4 years back, we are seeing an y-o-y growth of close to 45% in canopy sales. Being light weight, sturdy, rust free & easy to carry & install are things working in its favor. It is important that you design banner in accordance to the sizes specific to your canopy size. Fist of all you need to decide which canopy size will serve your purpose. Now, you can look for sizes mentioned below for designing canopy banner. If not sure you can always forward this web page to your designer. 4x4x7 ft canopy - There will be 7 banners in total 3 each in top & bottom and 1 as background. Top banners will be 4x1 ft size each & bottom banners will be 4x2.5 ft each where 4 ft is length. Background banner will be 4x7 ft.
6x6x7 ft canopy - There will be 7 banners in total 3 each in top & bottom and 1 as background. Top banners will be 6x1 ft size each & bottom banners will be 6x2.5 ft each where 6 ft is length. Background banner will be 6x7 ft.
You can get it designed in any format like psd, pdf, cdr, image jpeg, png etc. As mentioned earlier, canopy is fairly easy to install. It comes with collapsible aluminium frame which you can slide to dismantle. Making it portable & easy to carry. All canopy orders comes with stylish carry bag. We are delivering canopies all over India via Fedex at no additional cost. You can change banner in the canopy as and when you wish to. Flex can be cleaned with dry cloth. You can choose between normal flex or digital HP ink printed flex for your banner. Print quality of digital flex also known as eco solvent flex is better than normal flex. Digital flex is expensive print media. If you are looking for printing more than 5 canopies for your company then we can offer you great discounts, to know more, kindly feel free to contact us. If I place order for two designs 1 each then will I have to pay rates for 2 canopies? 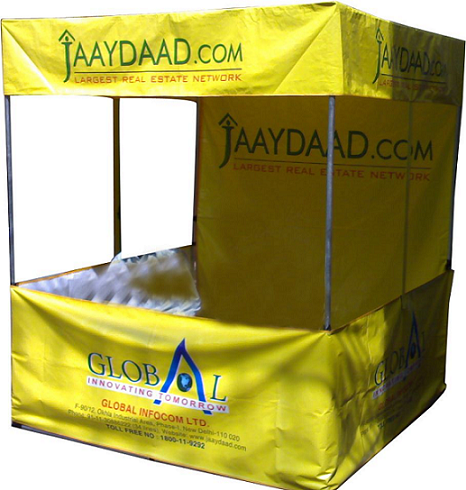 We wanted 1 canopy to be delivered to Gurgaon. I was confused between 4ft and 6ft canopy as I could not make out which size will fit it. They are expert in guiding and we decided to go with 4ft as it is good size for 1-2 marketing personnel to man the canopy. Print quality was good and they provide complete support in explaining how to design and making sure everything was as per the print guidelines. I will use your services for standee and other marketing items. We were completely unaware about this canopy. Wanted just 1 for distribution of our flyers. When we contacted them they not only guided us about what canopy is but also how to design it. We got it designed from our designer as per their specification. It was delivered to our office in Kormangala, Bengaluru in just 4 days. Our college regularly order standees from them. This time order a bigger 6x6x7 canopy. It is nice. Good job. Quality is good. Flex printing is also nice. Improve on delivery time. Urgent orders should be there even if at extra cost. I am from Ghaziabad. Ordered canopy for personal use from their Delhi office. Quality is good, it came with good bag and well packed. Our coaching class Venkat Sir Tutorial in Vijaywada Sector 11. We got 2 canopy done from them. We hired them for designing work as well. Their service is good and designers are understanding they make quick changes. I have fitness gym in Hyderabad. We purchased blank standees and canopy from them. Their price is less and quality is good. I got my exhibition complete stuff done from them including canopy for outdoor flyer distribution. This is a professional company. No followups, reminders or goof ups. They turn out on time and do a good finishing work. We display in many exhibition will take your service in future as well. Thanks. Prints have come out well. But it takes time to install and dismantle canopy. It takes around 5-10 minutes everytime. I was not aware about that at time of placing order, thought it would be like standee nothing to be done. Apart from time taken rest is fine. Thanks guys received my product today. It got struck in courier for 2 days. Products are nice but you need to follow up with courier agency to ensure it a quick delivery. Rest everything is fine. I am satisfied with your service. We normally get canopy from Sadar Bazaar area. We thought of checking online their price was good comparable to local printers price. They offer good support in checking design and ensuring everything is in order before final print. Also it was very well packed and sent via Fedex service. Our is a sports and fitness company operating out of Aundh, Pune. Last week we order for small 4 ft canopy from them. What we liked about them is that they guide customers quite well and their website has all the information about the products. We know exactly what we will get in advance. Height is 7 feets and 4 ft is the length and breadth of the canopy. Height is 7 feets and 6 ft is the length and breadth of the canopy.